Secrecy & The Ombudsman & Glen Eira! THE SHIRE’s chief executive, mayor and governance manager have been questioned over transparency issues and council decisions made behind closed doors. The revelation that the Victorian Ombudsman’s Office recently interviewed CEO Carl Cowie, mayor Graham Pittock, and governance manager Joe Spiteri came at last week’s council meeting after a member of the public gallery, Suzanne Kepert, asked what was discussed at the recent visit. “Were questions raised about matters not being properly discussed in open council meetings, and councillors’ use of, or overspending of, allowances, or are matters raised in the Ombudsman’s visit another secret to be kept from ratepayers?” Ms Kepert asked. Mr Cowie replied that the visit was “around transparency in local government and the decisions made ‘in camera’ versus those in the open public meetings”. “Mornington Peninsula Shire is around 10 to 15 per cent in camera compared to some other large municipalities which are up to over 35 per cent in camera, so we can draw some comfort we are as transparent as possible and aim to do better than that in the future,” Mr Cowie said. Governance manager Joe Spiteri said the discussion was not specific to the shire. The Victorian Ombudsman takes complaints about actions, decisions or conduct of staff at government authorities, including local councils. The Ombudsman, Deborah Glass, is able to investigate actions by councils such as planning permits, advertising and zoning, contracts, building, enforcement of parking, building or planning regulations, rate and service charges, and road building. In March, the Ombudsman — who said that secrecy in government could fuel suspicions and mistrust — began investigating the transparency of local government decisions after a pattern of complaints. Shire spokesman Mark Kestigian said the Ombudsman’s report would seek to find out more about issues including how often council and special meetings were closed, processes regarding confidential matters, the handling of delegations, and the quality and availability of record keeping. Mr Kestigian said the shire was one of many councils interviewed. The Ombudsman declined to comment on the visit. The Ombudsman is currently investigating ‘transparency’ in decision making by local councils. Glen Eira should and must be one of those investigated given recent events and the lack of accountable governance that has gone on for years in this municipality. The ratio of agenda items discussed in open chamber and those hidden away under ‘confidential’ is unacceptable. Worse still, is that a quarter of decisions made behind closed doors are never revealed! This is an abysmal record. 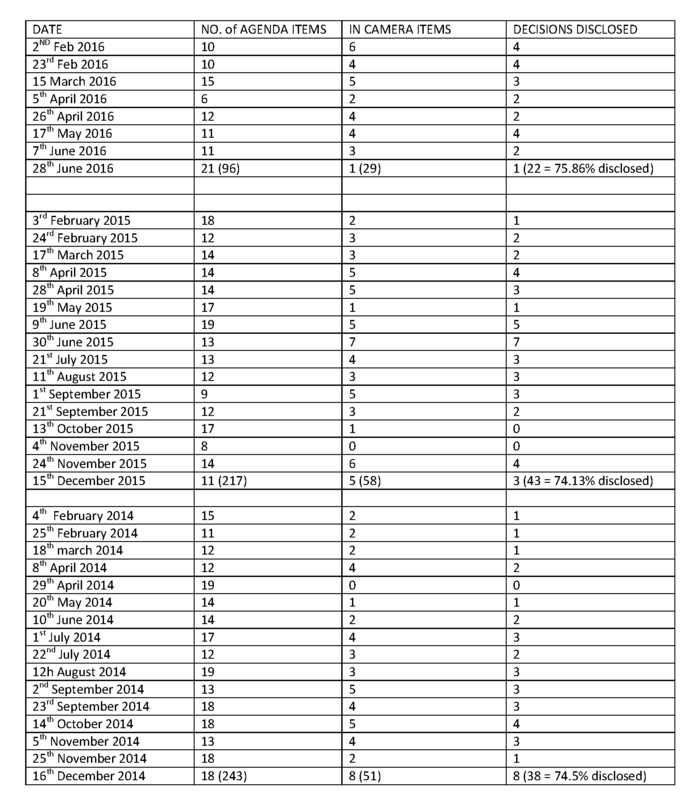 Here is the data which we have collated on council decision making from 2014 onwards. I can understand that tenders are discussed in private. But then residents should also be told why the successful tenderers got their contracts. We know nothing because they don’t publish anything like the criteria for selection, the prices offered by everyone, or if it was the cheapest bid. Someone also told me that Port Phillip doesn’t have anything declared confidential. It’s all out in the open. Minutes still missing. Maybe Burke is irreplaceable?
. used “confidentiality” as the basis for refusing to discuss the issue with ratepayers on the basis that it was confidential.